Many of us, when considering the prospect of taking a lengthy road trip, will say something like “Oh, my car can’t make it that distance!” Well wait, maybe it can. However, it might not be able to in its current state. Whether you’re driving a new car or a used car, there are some checks and changes that you’re going to need to make before hitting the highway. When planning your trip, don’t just plan for when you’re going to leave and when you’re going to return, rather, make sure that you’ve cleared some time in the days leading up to your departure in order to ensure that you’ll have the time to make the following checks and preparations. “Real men don’t need instructions” may be the motto of uber-macho men who would rather break down on the highway than let someone else tell them how to fix their car, but there’s a lot of useful information inside of your manual, and you should use it as a starting point. Your car may require special attention that we haven’t listed here, and it will let you know how to change your fluids and headlight bulbs and so on. Even if you’ve worked on a few cars before, every vehicle is different, and studying your driver manual will help you to better care for your car. If you can’t find it, you can usually download a copy online from the manufacturer. When you look under the hood, you’re going to want to check for leaks. Look at the battery terminals, are they clean, or are they caked with dried residue? How about the drive belt? If it’s cracked or glazed then you’re going to need to replace it. This is an important step to take before any long road trip. You’ll want ot start with the motor oil, which can be checked easily enough. Make sure that your car is parked on even ground, and then warm up the engine for a moment before turning it off. After a moment, the oil will drain down the oil pan, and you can pull the engine oil dipstick out to test it. Wipe it with a clean rag, reinsert, pull it out again and check the level. It should be close to the “FULL” mark on the dipstick. If not, you can top it off until it reaches. You’ll also want to check the color. If it’s overly black, then it’s time for an oil change. Bringing some extra oil with you whenever you take a long trip is a good idea, too. If your car has a transmission dipstick, then this check is easy.Warm the car up, park on a level surface, make sure the hand brake is on and let the engine idle. Pull the dipstick out, wipe it, and reinsert. Now check the fluid level and condition. You’re looking for a red or pinkish red color. If it’s more brownish, then it may be time to switch out your fluid. In order to check the coolant, all you need to do is make a visual check of the overflow tank. If the level is between low and full, then you’re good to go. Otherwise, you’ll want to go ahead and top it off. Check for leaks while you’re at it, too. In order to check the battery, you’re going to want to look for acid leaks, cracks and corrosion. Corroded terminals will cause a lot of trouble later on down the road. The tough part about checking your battery is that it may look just fine, but be ready to die at a moment’s notice, there’s simply no way of knowing except to get it tested before you hit the road. A battery should last three to six years, so if it’s new, you might not need to worry about it. Every car is different, so you’ll want to check your manual to see where the air filter is located and how to replace it. Unless you’ve just had it replaced, it may be a good idea to get a new filter just before you hit the road. You’ll want to check the horn, wipers and lights, just run them and make sure that they work. Keep a spare bulb or two in the trunk, check your A/C and heater, change the cabin air filter if you haven’t recently, and take care of any other odd electrical issues from the radio to the automatic windows if you have any issues you’ve been needing to deal with. If your wipers aren’t properly cleaning the windshield, replace them. You don’t want to be caught in a rainstorm with no option but to stick your head out the window in order to see where you’re going. You may also want to consider replacing missing rearview mirrors, cracked windows and windshields, etc. Check the air pressure in each tire, check for leaks, and make sure that you’re sitting on a firm set of wheels before hitting the road. If you’re experiencing any issues along the lines of the car veering to one side of the road or the other, if you’re hearing popping or rattling when you drive, then one of these issues may be the culprit. Unfortunately, the only way to really check anything listed above is with professional tools and know-how. A full garage checkup may not be necessary, of course, but it’s worth considering if you’re experiencing any issues not accounted for by your own at-home checks. Of course, given the nature of your car, your trip, and your circumstances, you’ll want to adjust this checklist accordingly. A spare cell phone may be a good idea for some, while others may have the time and money and choose to get a full change of tires before leaving. 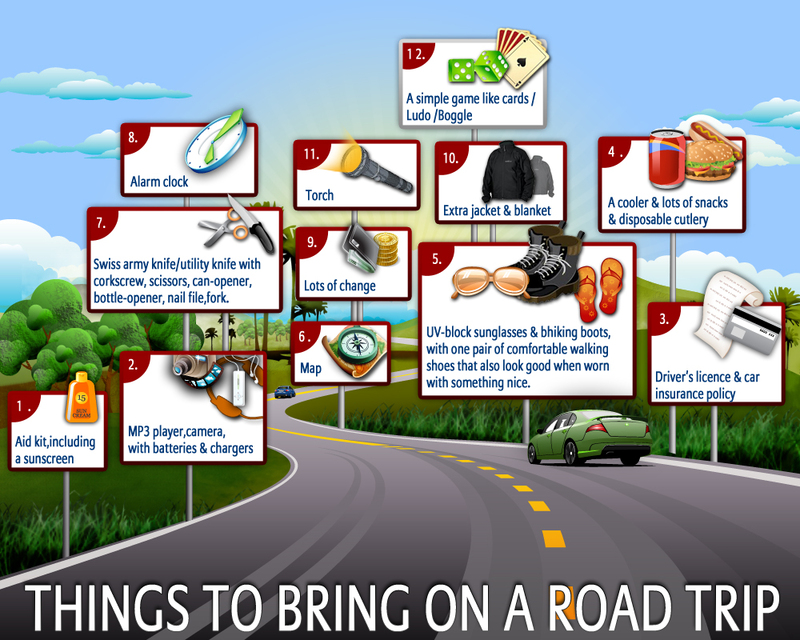 Do whatever you can to be safe, and to feel safe when you hit the highway for an extended trip.